Did you know that 24% of the 54 million Hispanics that make up the United States population identify as Afro-Latino? An Afro-Latino is an individual of Latin heritage that derives from African descent. Afro-Latinos come in various sizes, hair textures, accents, and skin complexions. Many people have misconceptions of what an Afro-Latino is supposed to look like, act like, and where they are from. Imagine being told who you are or aren’t whatever you identify as based on your outside appearance? It’s degrading. People must be informed about the culture of Afro-Latinos and realize that they are not the stereotypes others create, they are people with emotions that come in many forms. For decades, Afro-Latinos have been stereotyped by their outside appearance within their own community and by others. There has been a large controversy about how a “proper” Latino should look. The Latin community is known to glorify the white, light-skinned appearance of a Latinos and discourage those who have darker complexions. Why? A dark-skinned Afro-Latino still speaks the same language as a light-skinned Afro-Latino. Both share similar cultural backgrounds of Latin traditions, music, and foods. Yet, the stereotypes created about Afro-Latinos within the Latin community derives from the aspects of colorism and racism. Colorism and racism are forms of discrimination that correlate within the Latin community as dark-skinned Latinos are racially victimized because they are black and for the color of their skin. The idea of people praising lighter skin has been a part of Latin culture for decades. For example, Afro-Latinos continue to be excluded out of the community, seen as “invisible” and are offered lower roles in a workplace versus a light-skinned Latino. White appearance has always been favored and for those who have darker skin complexions are faced with unfair treatment. Along with the separation by outside appearance, there are similar opinions people share about being an Afro-Latino. For instance, many people believe that an Afro-Latino is either Latino or black. They cannot be both. They are either not Latino enough, too black or not black enough. There is no set of rules that make a person black or Latino, as if one’s ethnicity and culture is a test. Not only do Afro-Latinos face the degrading questions of what side they must identify as, but also many people urge Afro-Latinos to prove themselves. Afro-Latinos are constantly pestered by others to prove who they are with family history and personal background. It’s invasive and unnecessary. Afro-Latinos should not have to prove who they are, just like any other person from a different background as well as in their community. Unlike the stereotypes associated with being an Afro-Latino, there is evidence that has proved how influential and significant Latino culture is within the history of the United States. 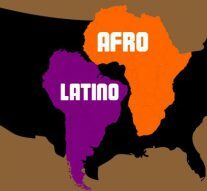 Many people perceive Afro-Latinos as separate from the United States citizens because they derive from other countries. Although, in 1492, Christopher Columbus traveled to the Caribbean region, U.S. Virgin Islands, and Puerto Rico, which made it the first step of the United States acknowledging the Latino culture. Columbus represents the United States history and when he discovered those locations, this was the beginning of Americans recognizing how prominent Latino, including Afro-Latinos, culture is. Furthermore, the Treaty of Guadalupe Hidalgo was the end of the war between the United States and Mexico, which resulted in the rapid growth of Latinos migrating to the United States in areas such as California, Arizona, and New Mexico. These two events in the United States history portrays the foundation of Latino culture and how they have become a part of the United States. As a result, many Afro-Latinos continue to live in the states and are involved within the community that makes up a large population of the country. There are specifically Afro-Latino explorers and founders that have influenced the United States. For instance, Afro-Mexicans became founders of the city of Los Angeles. Later, on September 4, 1781, El Pueblo de la Raina de Los Angeles became the home of forty Afro-Mexican settlers that are also known as pobladores. The pobladores’ descendants also influenced California’s government. Within Afro-Latino culture, Afro-Latinos have a reason to be proud of who they are and should never feel as though they are not intelligent or worthy enough to be who they are. There are several gifted people that happen to be Afro-Latino. Gilbert Faustina, an Afro-Cuban, had influenced United States history when he started a cigar factory in the South. Then, Faustina opened the Faustina Beach, which is the only beach that allows African Americans to attend in the Gulf of Mexico. Faustina further impacted the United States when he created the Knights of Peter Claver, which is an all-black group that protests the Catholic churches that neglected him for being black. Faustina is a prime example of an Afro-Latino founder that made a mark in history and transformed negative opinions from others into a positive act that does not neglect a person who is black and Latino. There are many historical Afro-Latino figures that also have made an impression on the United States. Jose Celso Barbosa, an Afro-Puerto Rican, has earned his title of being one of the most influential Afro-Latinos, showing just how powerful and worthy this culture truly is. Barbosa was a physician, sociologist, and politician who worked for Puerto Rican Governor, Charles H. Allen. Similarly to other Afro-Latinos, Barbosa faced many circumstances of racism and discrimination for being a Puerto Rican black man. Yet, the opposition and stereotypes from others did not prevent Barbosa from pursuing his dreams. He also established El Tiempo, Puerto Rico’s first bilingual newspaper. Barbosa was a diverse and intelligent Afro-Latino who proved that despite all the negativity one can still prosper. Due to all of Barbosa’s success and influence on Puerto Rican and United States history, he will always be known as an Afro-Latino historical figure. Also, Felipe Luciano is another example who is an Afro-Puerto Rican and has made a change for the Afro-Latino culture. Similarly, to Barbosa, Luciano is a multi-talented Afro-Latino who became a community activist, news reporter and anchor, poet, writer, and lecturer. Luciano faced oppression living in Harlem, in poverty, with a single mother and being both a black man and Puerto Rican. Yet, he strived for greatness and was asked by other Latino youths in 1968 to be the co-founder of a radical organization called the Young Lords Party. The organization’s focus was to protest Puerto Rican poverty and racism. Luciano’s voice and ability to express the hardships that all Afro-Puerto Rican youths were enduring during that time, encouraged all Afro-Latinos to embrace who they are and fight against the oppression that casted around them. When faced with negligence, stereotypes, and discrimination, it is important for Afro-Latinos to stand together and voice their opinions to create a change. Despite Luciano’s and Barbosa’s influence on Afro-Latino culture, the community is still trying to be heard. The Afro-Latino culture is a complex yet interesting heritage that many people who make up a large population of the United States derives from. After discussing the stereotypes, history, and historical figures that have empowered and influenced many Afro-Latinos, this must strike a change on how other people perceive being an Afro-Latino. It is important for everyone to believe in who they are, no matter what other people may say. Yvette Modestin, an Afro-Panamanian, once said, “I get my energy and strength from the spirit and words of my ancestors… my mother’s spirit that shines so bright… the unconditional love and support of my father and family.” Modestin speaks for all the Afro-Latinos that being black and Latino does not mean they are any less of a person. One must embrace who he or she is and stay true to themselves. The love and support from family and close friends make all the other negative remarks irrelevant. Header photo from Duke University. “Biography: Felipe Luciano.” Kepplerspeakers, n.d., hccfl.edu/media/519124/luciano%20f-bio.pdf. Davila, Arlene. “Racist stereotypes in Spanish language/Latino/a media.” Race & Ethnicity in Advertising America:1890, 2018, raceandethnicity.org/essays/racist-stereotypes-in-spanish-language-latino-a-media. Patiño, Jennifer. “Founders, Explorers, and Other Afro-Latinos in US History.” Gozamos, 22 Feb. 2016, gozamos.com/2016/02/founders-explorers-and-other-afro-latinos-in-us-history/. “Puerto Rico Profile: Jose Celso Barbosa.” Puerto Rico Herald, 3 Dec. 1999, puertorico-herald.org/issues/vol3n49/ProfileBarbosa-en.html. Rochin, Refugio I. “Latinos and Afro-Latino Legacy in the United States: History, Culture, and Issues of Identity,” Professional Agricultural Workers Journal, vol. 3, no. 2, 2016, pp. 1-22.